Albert Boton – born 17. 4. 1932 in Paris, France – type designer, graphic designer, teacher. 1952–55: trains at the Troy studio in Paris. Attends a course in calligraphy at the Ecole Estienne in Paris. 1955–57: type designer for the Deberny & Peignot type foundry in Paris under Adrian Frutiger and Ladislas Mendel. 1957–58: works in the graphics department of the Technès design studio. 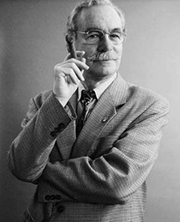 1958–66: type designer and graphic designer for the Hollenstein studio in Paris. 1966–68: works for the Psycho agency in Paris. 1968–73: art director of the Delpire agency in Paris. Designs for Cacharel, Citroën and Schlumberger, among others. Since 1968: teaching position for calligraphy and type design at the Ecole Nationale Supérieure des Arts et Design in Paris (ENSAD). 1973: self-employed designer. 1978–81: Guépard agency in Paris with Roger Saingt. Since 1981: art director to the Carré Noir agency. Since 1988: teaching position at the ANCT, Imprimerie Nationale in Paris.